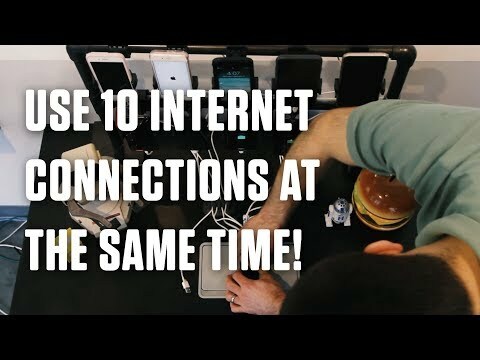 Combine multiple Internet connections on your smartphone or computer. Created by Connectify Inc.
A better Internet awaits: now you can combine all of your available WiFi, 3G/4G, and wired Internet connections to create a single, faster and secure Internet connection on your device. - Better Streaming - stream or broadcast live without throttling, errors, or constant bufffering. - Better Gaming - Improve latency and reduce lag for faster gameplay and more reliable performance. - Priority Rules - Set custom priority rules for each of your Internet connections and monitor usage with Speedify. Speedify uses a ChaCha- or AES-based encryption algorithm, depending on device support. Not even the most experienced hackers could snoop on the traffic going through our VPN servers. - Peace of Mind - Keep your personal data safe from hackers, snoops and other cyber criminals. - 3X Performance - ChaCha encryption cipher delivers 3 times the speeds of other VPNs. When you’re using Speedify, you automatically have an internet failover software solution up your sleeve. All you need is at least two available connections and you’re all set! - Reduce Packet Loss - Speedify uses a variety of techniques to fix lost and corrupted packets before they slow you down. - Redundancy - Data is sent across all available connections to provide maximum reliability and consistency. - Bye, Bye Big Brother and Throttling - If your network administrator keeps certain sites and services blocked, Speedify can help circumvent that. - Serious Privacy - Speedify will not sell, rent, or disclose your personal information to other companies. - Hide Your IP - Your web traffic will originate from one of our IPs, protecting your identity from snooping ISPs and hackers. Speedify was added by yajtyler in Oct 2014 and the latest update was made in Feb 2019. The list of alternatives was updated Mar 2019 There is a history of all activites on Speedify in our Activity Log. It's possible to update the information on Speedify or report it as discontinued, duplicated or spam. Alternatives to Speedify for Windows, iPhone, Android, Mac, iPad and more. Filter by license to discover only free or Open Source alternatives. This list contains a total of 25+ apps similar to Speedify. Maybe you want to be the first to submit a comment about Speedify? Just click the button up to your right!